We are happy to announce that as of 2018 we have been contracted under the manufacturer’s umbrella contract with NEC corporation to provide the following services for all state government agencies, municipalities and non-profit organizations. Contract # PM20910. The contract allows you to work directly with Superior Telephone to procure telephone equipment, including engineering and the designing of the IP, LAN/WAN integration. This permits you to use the New York State contract without going out to bid via the RFP process. 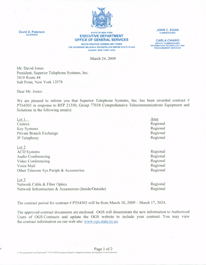 Superior Telephone is proud to have been awarded many OGS contracts. Recently, we implemented the design and installation of the communication systems for the Town of Carmel, Town of LaGrange and the Fishkill Police Department. At each location we coordinated the carrier services for their new facilities’, network infrastructure wiring and IP telephone and voice mail system integration which included our unlimited training and support. We have also deployed the City of Peekskill’s telephone system with centralized voice mail at 14 locations. Superior Telephone also installed a telephone system at Cronomer Valley Fire Dept. and several numerous municipalities/businesses in the Tri-State area over the years. Headquartered in Dutchess County, New York for over 31 years, Superior Telephone is a provider of world-class telecommunications and networking products and services to customers of all sizes. Our technical staff has a combined total of over 308 years of telecommunications knowledge and we take pride in delivering prompt and professional services. Superior Telephone provides network design and engineering, implementation and service support to over 7,000 business customers in New York, Massachusetts and Connecticut. We provide IP telephone, voice mail, and ACD systems from NEC, We provide networking products for standard category 5E, 6, 6E, & 7 plus fiber optics, from manufactures like Cisco, Panduit, Leviton, Allentel, Corning and AMP. We offer Audio and Video Conferencing systems from Yealink. Let us certify your network!